74 SMT Magazine • November 2015 corporates a flux core, so pre-fluxing is neces- sary. Simple irons don't provide much control on temperature, while others can provide vari- able temperature control to prevent under- and over-heating components. This method is very labor intensive, and thus is used only for very low volumes. Quality is dependent on the op- erator's training, experience and skill. Training courses and standards are available for person- nel to improve their quality level. 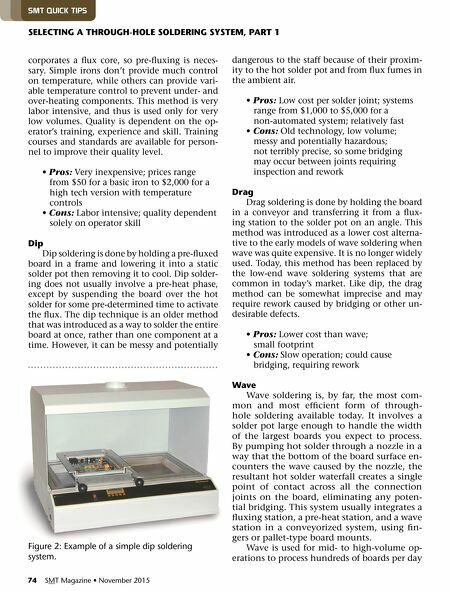 • Pros: Very inexpensive; prices range from $50 for a basic iron to $2,000 for a high tech version with temperature controls • Cons: Labor intensive; quality dependent solely on operator skill Dip Dip soldering is done by holding a pre-fluxed board in a frame and lowering it into a static solder pot then removing it to cool. Dip solder- ing does not usually involve a pre-heat phase, except by suspending the board over the hot solder for some pre-determined time to activate the flux. The dip technique is an older method that was introduced as a way to solder the entire board at once, rather than one component at a time. However, it can be messy and potentially dangerous to the staff because of their proxim- ity to the hot solder pot and from flux fumes in the ambient air. • Pros: Low cost per solder joint; systems range from $1,000 to $5,000 for a non-automated system; relatively fast • Cons: Old technology, low volume; messy and potentially hazardous; not terribly precise, so some bridging may occur between joints requiring inspection and rework Drag Drag soldering is done by holding the board in a conveyor and transferring it from a flux- ing station to the solder pot on an angle. This method was introduced as a lower cost alterna- tive to the early models of wave soldering when wave was quite expensive. It is no longer widely used. 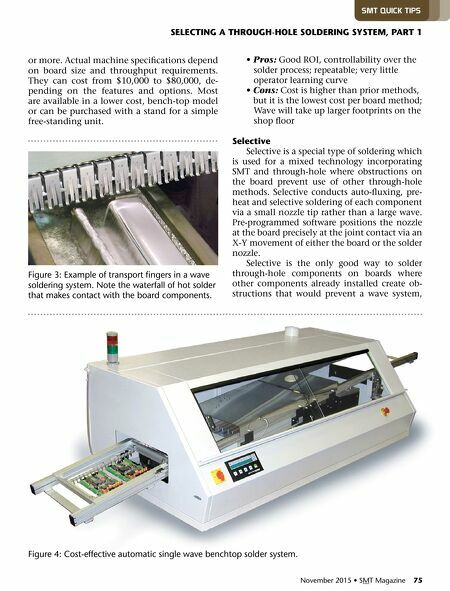 Today, this method has been replaced by the low-end wave soldering systems that are common in today's market. Like dip, the drag method can be somewhat imprecise and may require rework caused by bridging or other un- desirable defects. • Pros: Lower cost than wave; small footprint • Cons: Slow operation; could cause bridging, requiring rework Wave Wave soldering is, by far, the most com- mon and most efficient form of through- hole soldering available today. It involves a solder pot large enough to handle the width of the largest boards you expect to process. By pumping hot solder through a nozzle in a way that the bottom of the board surface en- counters the wave caused by the nozzle, the resultant hot solder waterfall creates a single point of contact across all the connection joints on the board, eliminating any poten- tial bridging. This system usually integrates a fluxing station, a pre-heat station, and a wave station in a conveyorized system, using fin- gers or pallet-type board mounts. Wave is used for mid- to high-volume op- erations to process hundreds of boards per day sMT quIck TIps SeLeCTING A THroUGH-HoLe SoLDerING SySTem, PArT 1 figure 2: example of a simple dip soldering system.